Having had the opportunity to drive a lot of cars over the years, there is one car group above all others that is the hardest to crack. We’re talking about the ‘C’ Sector, long dominated by the Volkswagen Golf, Ford Focus & Vauxhall Astra. 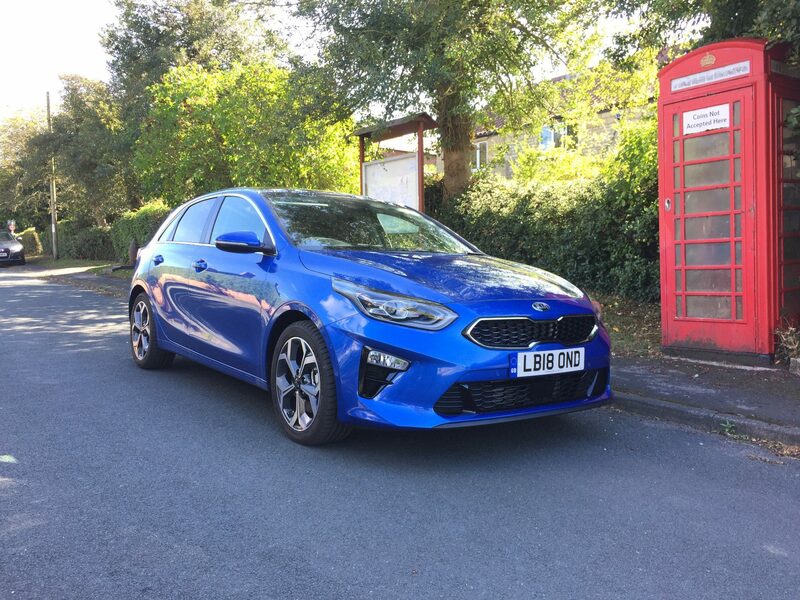 None, including the Toyota Auris, Nissan Pulsar, Honda Civic, Mazda3, Hyundai i30 or Kia Ceed have really rocked the sector, but that hasn’t stopped all of the above trying. 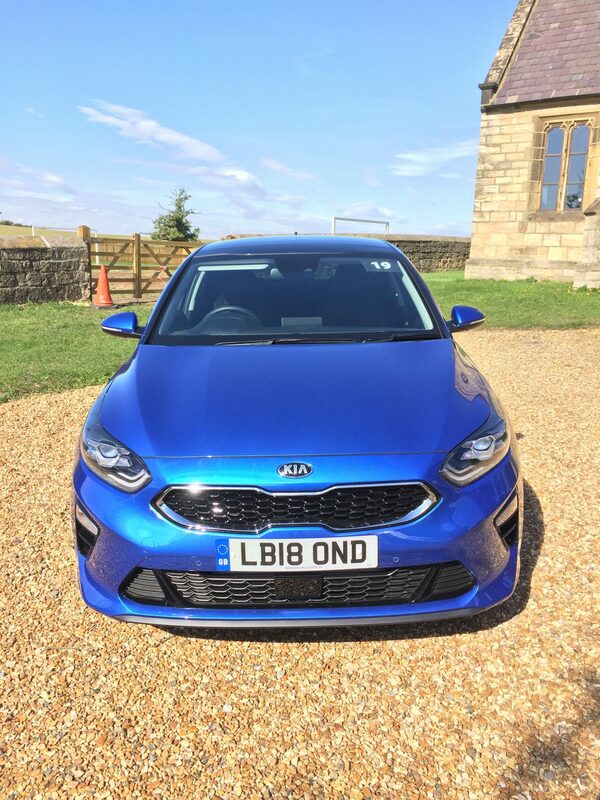 Kia are the latest to have a go, with the launch of their latest Ceed. Company Car & Van recently got our hands on the all-new Ceed 1.4 T-GDi First Edition.The Ceed has been made to appeal to the European C-segment hatchback market. It’s designed & built in Europe & is sold exclusively in Europe. The third generation Ceed looks much fresher than it’s predecessor & it features Kia’s tiger nose grille, sweeping headlights & a more aggressive lowered & wider front air intake. The rear isn’t as striking & is reminiscent of both the BMW 1 Series & Vauxhall Astra, with a spoiler above the rear window & wrap around rear lights. The Ceed has been built on Kia’s new K2 platform, which has made the new model 20mm wider, lowered the roofline by 23mm & it’s now 95mm longer. The wheelbase remains the same as before at 2650mm. The cabin though, has been moved back 68mm, to improve occupant protection & visibility around the A-pillars. The First Edition looks the part too, with 17″ alloys, LED Bi-function headlights, LED rear lights, privacy glass, LED daytime running lights & a wide sunroof fitted with an automatic roll blind. The interior will be familiar to anyone who has a Kia. The quality is good, but not quite up to the inside of a Golf or latest Ford Focus. There’s soft touch plastics on the top of the dash & the First Edition also features black leather seats, a leather trimmed steering wheel & gear stick. Lower down there’s cheaper looking, harder plastics on the centre console & door pockets, which is a surprise. The infotainment system though is first class. First Edition offers an 8 speaker JBL premium sound system, USB & aux in sockets, a USB fast charger in the front centre console, Android Auto & AppleCar Play with voice control, a wireless mobile phone charger, 8″ touchscreen SatNav, a reversing camera, DAB, Bluetooth, plus smart park assist. It’s all tidily packaged in a dash-top screen. 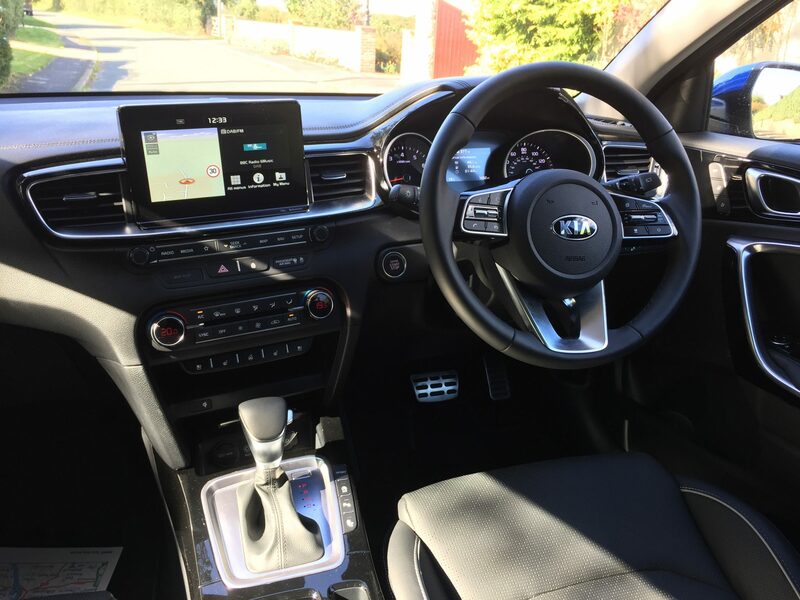 This First Edition is specced up to the Nth degree & also comes with a heated steering wheel, heated front seat & outer rear seats, engine start/stop with smart entry system, dual automatic air con & smart cruise control with stop & go functionality. Active safety is impressive. Blind Spot Collision Warning, High Beam Assist, Lane Following Assist, Speed Limit Information Function, High Beam Assist, Forward Collison Avoidance Assist, ESC, ABA, ABS, EBD, Lane Keeping Assist, Driver Attention Warning & Intelligent Stop & Go are all fitted. Another bonus with all Kia models, is that the infotainment settings are easy to get the hang of. Bluetooth connected quickly & with a USB lead, AppleCar Play as well. I made a couple of hands-free calls whilst on the A1 & the sound was clear, enabling me to have a conversation without raising my voice. For those of you looking for a family company car, the Ceed’s interior space is impressive, with good leg & headroom in the rear & there’s 395 litres of space on offer in the boot, 1,291 litres with the rear seats folded, which is more than in either the Focus or Golf. The boot floor can be raised to make loading easier, which is handy, because the boot does come with a reasonably high lip. Our first Edition featured the nippy 1.4 petrol engine, but there’s also a 1.0 litre petrol 3-cylinder 118bhp & 1.6 litre diesel with 114bhp on offer, with a more powerful Ceed GT on the way. First Edition isn’t cheap, with our test car retailing at £26,850 OTR. Combined fuel consumption for the 1.4 is 50.4mpg on the combined cycle & it’s CO2’s are 127g/km. The 3-spec model is also more costly, so we would suggest that company car drivers consider the 2-spec petrol model with the 1.0 litre petrol engine. It’s not only cheaper, with the range starting from £18,295, it also comes well equipped with 16″ alloy wheels, air-con, a 7″ touchscreen audio display, DAB, a reversing camera, cruise control & Forward Collision Assist. In 1.6 Eco Pack diesel guise, kitted out in 3-spec, the fuel economy is even more impressive, with a combined figure of 74.3mpg & low CO2 emissions of 99g/km . The diesels is more expensive, with the range starting at £21,955. As with pretty much al new cars out there, yet again you have an example of a clean Euro6 diesel in the Ceed, offering drivers over 20mpg more than the petrol version & with lower emissions too. High milers & DOT employees, please take note. 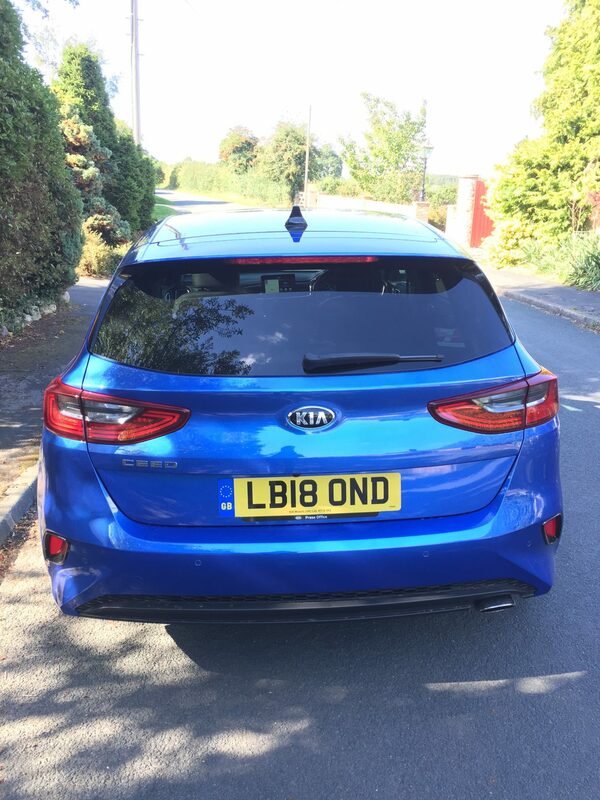 In conclusion then, has the new Kia Ceed got what it takes to match or even beat the Volkswagen Golf ? The easy answer is no, But there is some god news. The new Ceed is a really good effort from the Koreans. Not only is the latest version around £2,000 cheaper than the equivalent Golf, it’s also better value than the Ford Focus, has more space in it than both & comes better equipped like for like across both model’s range’s. 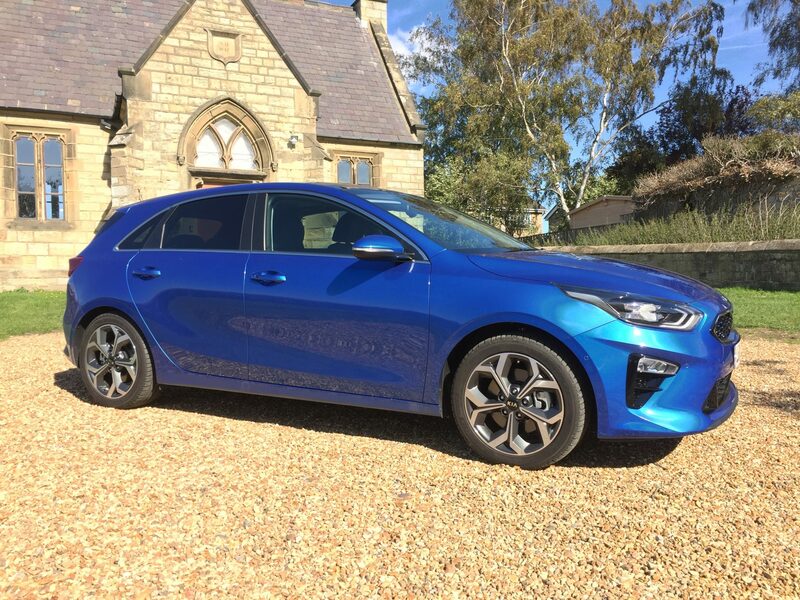 I would gas far as to say that Kia weren’t really expecting to better the Golf, but what they have done is make a car that’s equally as good as the Astra & better than the likes of the i30, Auris, & Leon.